Don Mattrick is in the middle of a rotten situation, but he's putting on his brave face. 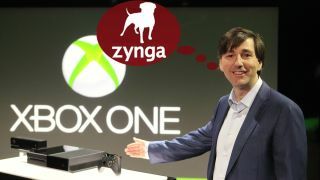 "The next few years will be a time of phenomenal growth in our space and Zynga has incredible assets to take advantage of the market opportunity," the former head of Xbox said in an earnings press release for the social gaming site he now leads as CEO. "We have a lot of hard work in front of us and as we reset, we expect to see more volatility in our business than we would like over the next two to four quarters." Zynga's struggles are well documented, but as the company reported its Q2 2013 earnings today, we learned that revenue dropped 31 percent year-on-year, with a net quarterly lost of $16 million (about £10.4m, AU$17.3m). Users were down too; the company saw a drop from 306 million monthly active users in Q2 2012 to 187 million in the last quarter. Daily active users fell from 72 million to 39 million year-on-year. Despite mounting losses, Zynga maintained that its biggest opportunity is in free to play social games. Though the firm "continues to evaluate its real money gaming products" in the U.K., the company won't pursue obtaining licenses needed in order to establish similar properties in the U.S.
Real-money versions of ZyngaPlusPoker and ZyngaPlusCasino are running in the country, and though Zynga stated a "long-term vision" to bring the experience of gambling across platforms "in regulated markets worldwide," the States don't seem to be on that list. We can brace ourselves for a few more cringe worthy quarters from Zynga, but does Mattrick have what it takes to turn this once great gamer around? Only time will tell. Apple had a record quarter...but only for one product.